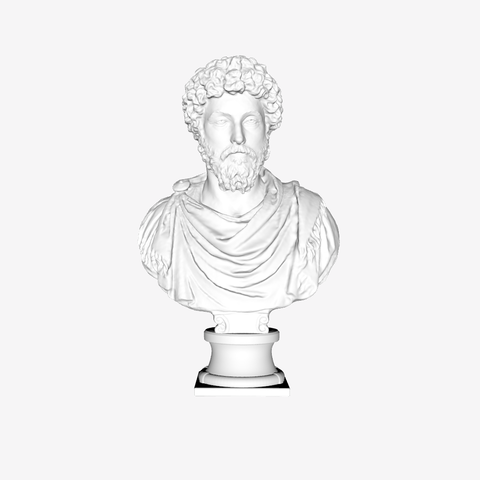 The bust is a (probably posthumous) portrait of Marcus Aurelius, emperor from AD 161 to 180. The technical skill, notably in the treatment of the hair and beard, typifies the so-called baroque style that was fashionable during the second century AD. This, together with the subject's enraptured expression and colossal dimensions, served to transfigure the emperor's image, emphasizing his elevated rank and exceptional character. This colossal head, mounted on a modern bust, represents Marcus Aurelius, who reigned from AD 161 to 180. The large, protruding eyes and skillfully rendered mass of hair and beard are familiar features of portraits of this philosopher emperor.